Recently, many new climbing gardens have been established at the foot of Zugspitze. They offer a great range of all difficulty levels in a magnificent alpine terrain. In summer, the Southern routes can already be climbed very early in the morning. You are back in Ehrwald in no time. If you want to go both hiking and climbing, visit the Wiener Neustädter Hut („Neustädter Hütte“) and the Coburger Hut („Coburger Hütte“). They offer great food and the climbing gardens are only 15 minutes away. Moreover, the region has several multi pitches and ice climbing possibilities in winter. The Zugspitze is the highest mountain of Germany. It is located right above the village Ehrwald in Tirol. The area around the Zugspitze is characterised by magnificent landscapes, pastures and magnificent mountain lakes. The possibilities for outdoor activies seem to be endless: You can go hiking, climbing, mountain biking, golfing and do extreme sport. ● The Ehrwalder Alm lies on an altitudel level of 1.500 m and is easy accessable by foot or cable car. This hiking and skiing paradise is a great experience in winter and summer. ● Explore the Zugspitze: Its view is amazing! Taking the cable car from Ehrwald to the mountain peak is a great experience! Each one fits up to 100 people! ● The premium restaurant Holzerstubn in Ehrwald offers delicious local culinary delights – it is highly recommended! 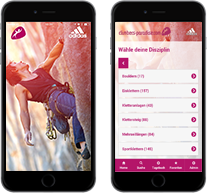 ● In case of bad weather, visit the local climbing gym Ehr"WALL"d in Ehrwald! ● There are several high alpine hikes which require experience and endurance in the Zugspitze region. One such hike is the Jubiläumsgrat or the hike up to Höllentalanger Hut in Höllental („Höllentalangerhütte“).